Yes, a sorry reminder that we’re back to Monday, but what’s a better start to the week than shopping away your Monday blues? None, that’s right. Mike’s back again with more men’s style advice, this week he’s gone for something a bit more formal, he scrubs up well doesn’t he eh? He’s wearing a beautiful, handmade shirt by Asobi Fashion. It’s a unique, red shirt with an unusual high collar, which features a second ‘tab’ collar that is folded over and buttoned down. It also has double breasted pockets, a button down front with fitted seaming and big red buttons to finish. Smart. The shirt is made from a thick cotton twill with a small zigzag pattern and a ‘crease’ finish. We actually think the finishing is just incredible with a white seam throughout. Hard to believe it’s handmade! If you’re not feeling the high collar it can easily be unbuttoned and folded down for a more traditional look. These shirts come in at £69.99 but for a one-off, handmade, exclusive formal fitted shirt, we really don’t think that’s too bad. 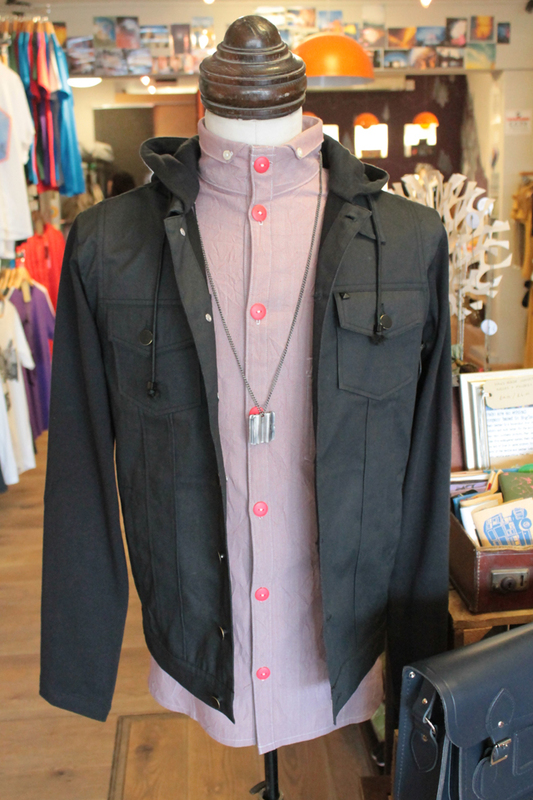 Over the shirt our Mike’s rocking a KR3W Stokes jacket in black. It’s difficult to know where to start with this light-weight jacket because it’s SO GOOD. Definitely one of our top picks for Summer. The Stokes jacket is a Chad Muska signature design for KR3W, made from mixed material (98% cotton/2% stretch broken twill light weight jersey) and has a waxed body with sweater sleeves and hood. 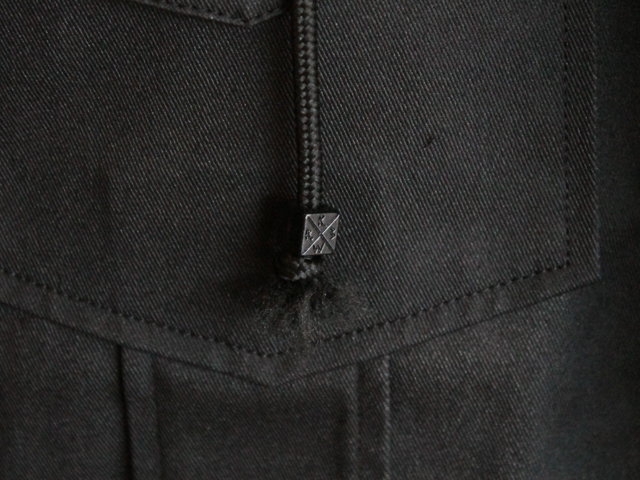 The hood is draw string and it features gun-metal popper fastenings down the front. You also get double breasted panelled pockets and open hip pockets. 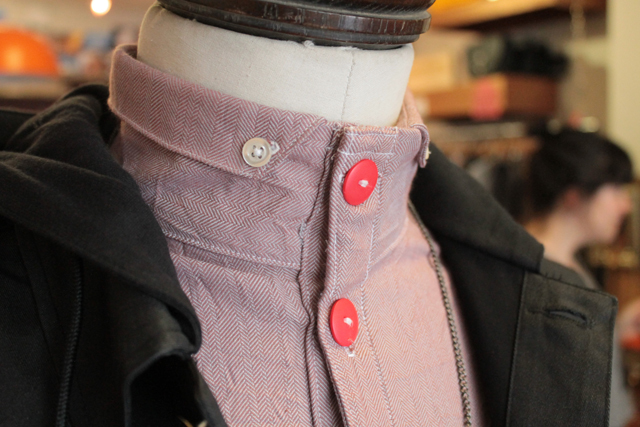 As with most of the pieces we’ve been featuring on our mannequins, we think it’s the finishing that makes the jacket stand out. 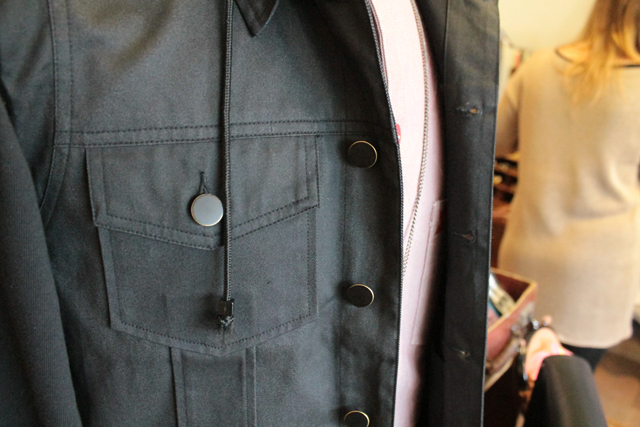 Check out the KR3W branding throughout, even down to the pin badge on the pocket. Sweet! Understated, we’d say. Finishing off the look, Mike’s wearing a piece by our latest jewellery range ‘Brutal Jewellery’. Designed and made here in England don’t you know! Sheffield to be precise. Mary would be proud. 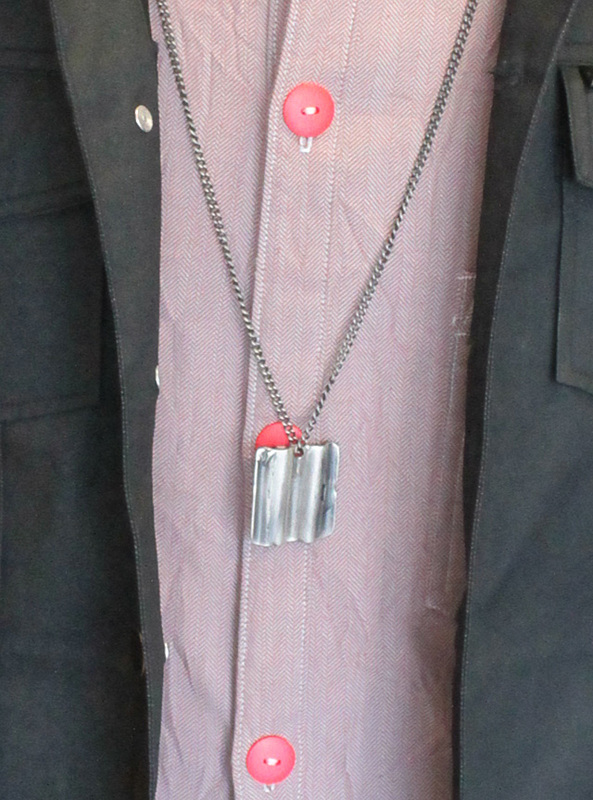 We think the ‘Corrugated’ necklace breaks up the red and black colours nicely but is in-keeping with the metal edge. The jewellery is plated in antique silver and makes a bold statement against a relatively simple outfit. If you’re feeling the necklace, go to the Brutal Jewellery facebook page and see what else they’ve got – it’s all good. So what do you think of Mike’s smart/punk look? Black, red and metal are a winning combo we think! Let us know in the comments, we love your feedback. This entry was posted in Mannequin and tagged advice, Asobi Fashion, Brutal Jewellery, clothing, fashion, how to, kr3w, kuji shop, Made in England, men's jewellery, menswear, style, unisex jewellery, www.kujishop.co.uk. Bookmark the permalink.